Please Do Not Litter Our Village. Respect Others and Your Environment. If you feel that you could spare a little time to improve our village, please meet us at Greyhound Court on the last Saturday of each month, at 10.00am, for a litter pick. The group would like to say a ‘BIG’ thank you to all people who have worked hard in maintaining the flower beds throughout the village. Not forgetting, of course, all the generous donors of money, to purchase flowers and troughs. Anne Shaw, Phil Shaw, Roy Dutton, Chris Wright, Lynda Berrington. Anne Nicholson had contacted Street Scene about the litter on Bowsey Wood Road and Bar Hill but has not received any response. Lynda Berrington raised the issue of grass not being cut at the entrance to the village by Eternit and the Miners’ Wheel. The general untidy state of footpaths, road gutters and hedges was commented upon. The accounts show £836.98 however funds of approx. £140 have been reserved for plants and miscellaneous equipment. We have received a donation from the Premier shop which is gratefully accepted. Offers have been made by other sponsors but this may be contingent upon notice of such sponsorship appearing in the relevant beds/planters. To be discussed further. Photographs have been taken and included in an article for the forthcoming Parish magazine. Thanks to Phil for his efforts in publicising the work of the group. There are 126.5 hours of gardening logged so far this year. Thanks to everyone. Please let Anne know the hours you are spending on gardening so that an accurate log can be kept. It was very disappointing to note that some plants had been removed (stolen) from the Miners’ Wheel and Crewe Arms beds shortly after they had been planted. Lynda has replaced them at additional cost and effort. Having taken on the bed outside the John Offley School this has had a radical pruning to try and establish what plants are there. Hopefully most of the shrubs will start to grow in the Spring. Those that do not will be replaced with more manageable planting. We received a request from a resident to remove a sycamore stump from the Isaak Walton bed. The same resident has planted two rhododendrens in the bed. There have been 81 (correction) hours of litter picking logged. Next litter pick is Saturday 28th October. We received a thank you card from Terry and Mary Edmond. Helen Dutton has arranged the Christmas meal for the 8th December at the Old Swan, Madeley Heath. The next meeting will be the Annual General Meeting and will be at the Madeley Centre (Bar area) starting at 7.00 pm. Please could all reports be submitted to the Chair by Monday 6th November. Post meeting note: The Isaak Walton bed will need a final tidy up before winter as will the Vicarage Lane once the bedding plants have died back. Alan Woodhouse, Anne Shaw, Phil Shaw, Roy Dutton, Helen Dutton, Anne Nicholson , Terry Edmond, Mary Edmond. Chris Wright , Liz Walker , Lynda Berrington. Anne Shaw had arranged for a visit to the recycling facility but unfortunately the person that this was arranged with no longer works there. Anne will try to re arrange. Bins for dog waste cost £350 plus the cost for emptying. There are proposals for new laws to come into force later this year. Owners when walking a dog must carry cleaning up equipment or risk an on the spot fine . When walking a dog near recreational areas such as playing fields , football pitches and children’s playing areas they must be on a lead. Anne Nicholson to contact Street Scene about the litter on Bowsey Wood road and Bar Hill as well as gutter cleaning . There will be a cost of approximately £100 for 10 Hi vis jackets. The leaflets in the local shops have been topped up . The minutes of the Tidy group meetings are on the web site. Our offer to contribute an article and photographs for issue 10 of the Parish magazine was not accepted. There are 125 hours of gardening logged so far . Thanks to everyone. Please let Anne know the hours you are spending on gardening so that an accurate log can be kept. Chris Wright will order bulbs from Newcastle under Lyme Council. Anne Shaw has ordered 245 spring bulbs from a mail order company. It was decided to plant some plants in the Offley Arms bed. Alan and Anne have spare plants. Roy has a spare conifer . It was decided that the gardening diary was a success, So the idea will be kept for next year. There have been 85 hours of litter picking logged. Nicola from Furness Lane has volunteered to litter pick at Furness Lane and the One Stop carpark .This is a large area so help will be required. Consider putting up “Keep your village tidy” signs on flower beds. Pat Forster to join the Tidy Group litter picks. Next litter pick is Saturday 30th September. The Tidy group has not responded to the Madeley Parish future plans survey but individuals have. It wasn’t known how the results would be distributed to villagers. Terry and Mary Edmond are due to leave the village in the next few weeks. Individuals from the Tidy group presented them with flowers and a present. This was to show appreciation for the enormous amount of work that they had undertaken around the village over the years. Anne has spoken to Councillor Whitmore about the geese fouling . She has been assured that action will be taken by the Parish Council. Thanks to Helen Dutton who volunteered to arrange the Christmas meal once again. Possible dates are 8th, 12th , 13th December. A plant has disappeared from the Offley Arms bed. Thanks to Helen for organizing the Christmas meal. council. The meeting was to discus what help was available for local organizations . help. Jan Simpson the Parish clerk is taking the lead . The Tidy group reserve policy has been formally adopted. Chris to contact Simon Long about details of help available for building bug boxes. £82.50 has been paid for insurance. Lynda Berrington gave permission for the magazine to give a brief mention of John Berrington. agreed that the dates were ok. The gardening is to stay on a Monday as this seemed to work well last year. The 10th April is a possible date for the re planting of the Long trough. Phil has volunteered to bring photographs to the next meeting. Alan has agreed to store the soil improver from the council until required by the group. Thanks to Lynda who has volunteered to look after the Crewe arms bed. There is some useful gardening information on the RHS website. Tony Ingram has suffered a slight stroke but is recovering well. Communities day is the 9th June. unavailable for the next one. Leaflets are now placed in local shops and on the web site. Anne put forward a suggestion about trying to arrange a visit to the Newcastle recycling centre. It is with great sadness to report the passing of Billy Welsh .A great supporter of the Tidy Group. His funeral was extremely well supported and thanks to all the Tidy group members who attended. Alan has emailed Roy the Tidy group constitution. The insurance was last paid in January 2016. (£82.12)There will be a small increase in the premium next year. Some pupils from Madeley High school did a litter pick today (12th July) and did a great job. During the next council meeting we could try and find out, who owns the land that the long trough sits on. The pond dipping with the children from the Meadows school has been thwarted. It was decided to concentrate on litter picks. Maybe bug houses? The balance on the 12th October was £1106.21. but there are commitments of £75.49 to remove from this total. £300 had been received from the Parish council. There was a record on the minutes dated 12th September requesting £750 but there was a limit of £300 which was granted. It was decided that a reserve policy needed to be adopted. Roy volunteered to work on this. Phil has taken several photographs of the flower beds and has emailed them to Tidy group members. Chris Wright has ordered some daffodil bulbs from the council. There has been 105 hours of gardening recorded so far. The lavender in the Offley arms bed has been replaced. Thanks to Roy and Helen for replanting the Evening Spice bed. New gardening dates have been added. The Christmas meal has been booked at the Old Swan on the 2nd December at 7.30. Helen said she would email the menu. A £5 deposit was requires per person. A total of 81 hours had been logged so far. Phil asked for a longer litter pick so he could reach into the river. Anne will write to Simon White to ask about the litter picking scheme that he was going to come and talk to us about. Long trough 31st October. Replant? Chris Wright, Melanie Bishop, Sarah Franks, Simon White. Anne Shaw has some spare Hi vis jackets if anyone requires one? The groups insurance is due and will see a slight increase in the premium. Alan to email Roy the Tidy group constitution. Anne Nicholson had been on holiday, so there had been no further developments with the activities for school children. It was decided not to apply for the Communities chest this year. Billy Welsh gave the go ahead to save the £1000 towards building a fund to replace the long trough at a future date. It was decided to apply to the Parish council for £750. This would go towards £160 for Pond dipping at the Meadows school , £240 for plants in the Vicarage Lane bed. Roy to arrange a meeting about Tidy group reserves. Leaflets are being replaced by Phil. Phil has designed a A5 poster for the shops and the notice board. It was decided not to ask local businesses for sponsorship this year. There has been 89.5 hours of gardening time logged. Just a reminder that if any gardening is done please record your time and forward it on to Anne. Some heather has been planted in the barrel. Phil came up with the good idea of taking photographs of the flower beds throughout the year. Phil has volunteered to put the photographs onto Face book. It was decided not to order any daffodil bulbs this year. Alan to make enquires about any other bulbs available. Tidy group Christmas meal. Anne had a menu from the Hand and Trumpet. Phil is going to the try the Crewe arms. It was also agreed that the Old Swan was a success last year. A possible date is the 14th December. Helen volunteered to organize the meal. Anne Shaw let the group know that she was taking the roll of Ladies captain at Onneley Golf club in 2017.This would give her less time to organize the Tidy group so would require extra help. Bag ‘o’s have been ordered and given out. Anne to give Roy the details so that he can order 4 more. There has been 65.5 hours of litter picking done so far this year. It was noted that the main road was steadily getting worse. One of the bins had been moved to a new location. Alan Woodhouse, Anne Shaw, Anne Nicholson, Phil Shaw, Lynda Berrington. John Berrington ,Chris Wright, Roy Dutton , Helen Dutton. 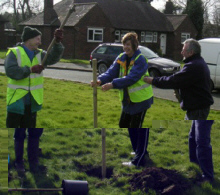 Ricki’s commemorative tree planting ceremony was a great success. Thanks to Andy Capewells contribution to the Tidy group. He has now emigrated to America. Trevor and Mary Edmond and John and Lynda Berrington require hand delivered minutes. The drain by the butchers has been cleaned. Anne Shaw received an email thanking her for highlighting the problem. Having previously asked the tidy group if they would be willing to fund some school based projects I approached Apedale to see if they were able to lead activities. They were unable to help us currently so I was put in touch with Tim Coggins who leads wildlife projects as a business venture. He is a resident of Madeley and was willing to reduce session rates as we would be working I local schools. These would be £80 per half day session. Meadows Primary were the first to show an interest and a half day session was booked to take part in pond dipping and bug house making on Friday 24th June. Helen Proctor the headteacher suggested that we take the year one and two to the grounds over the road from the school owned by Eternet, ( they have permission to use these grounds as their own are limited). I would also help with the session as a CRB cleared adult. As this date approached Tim contacted me to say that having visited the site at Eternet which would be used for the pond dipping, he decided that it was too overgrown and therefore unsafe for the children to access. He suggested that we re arrange the date for September when he would have more opportunity to clear the site and therefore make it safe. Sir John Offley have more recently replied to my email to say that they are also keen to arrange a wildlife project within their own school grounds. Tim is willing to do both seasons but would prefer to wait now until September. The new school year. Any help clearing the Eternet site would be appreciated. Once I have confirmed the new dates I will let the Tidy group aware. There is no report due to holidays. John and Lynda Berrington had received some Tidy group correspondence from the bank that had the incorrect address on it . This has now been forwarded to Roy Dutton. Phil Shaw has designed an ‘A’ board to advertise the Tidy group. This has been used when the Offley Arms bed was weeded. Phil has also uploaded the Tidy group minutes onto the Madeley website. There has been 32 hours of gardening time logged. Just a reminder that if any gardening is done please record your time and forward it on to Anne. It was decided to change the gardening time to 14.30 instead of 10 .00 to see if this better suited people. The next gardening meet will be at the Issac Walton bed on the 18th July at 14.30. Thanks to Terry Edmund for cutting back the trees that over hung the pavements. The container on Beven Place needs a bit of colour adding into it. Chris Wright is hoping to organize bird box building on the September Madeley fun day. Phil Shaw,s new neighbor, Tony has shown an interest in joining the Tidy Group. So far this year there have been 47 hours logged. There have been a couple of people showing an interest in joining the group on litter picks. The Beavers also joined the Tidy group on a litter pick,this proved a great success. Anne Shaw has obtained a couple of bag ‘o’s which are now been used. It was suggested that a few more be sought. Anne Shaw is going to order some more high vis vests. There was an excellent turn out for the latest litter pick. The bin opposite the chemist has been vandalized. July 30, August 27 , September 24 , October 29 , November 26. An improved household recycling scheme has started. This now includes a weekly collection service. Try to recycle the litter pick bottles and cans. There will be a tree planting ceremony to commemorate the memory of Ricki. This will take place at the Madeley centre 21st May at 14.00. Anne Nicholson has spoken to Pete Wells from Apedale. Who informs us that he is no longer funded so will not be able to help with any projects. Anne has also spoken to Tim Coggins from Bar Hill who has experience with school projects who could help. It was decided that half a day at the Meadows and half a day at the Sir John Offley would be the best way forward. The Madeley fun day will be on the 10th September .Chris Wright will head a project building bird boxes. Anne Shaw emailed Simon White to ask about the Communities day. Anne will also buy some bag o ‘s off the internet. Minus two cheques with the value of £76.00. It was decided to set up a fighting fund so that the long trough could eventually be replaced. Billy Welsh has kindly offered to fund the geraniums in the vicarage lane bed. Phil Shaw has kindly placed labels on all the leaflets with a new telephone number. An idea of a A board to advertise the Tidy Group was put forward. This could be placed out when any gardening was been carried out. This was thought to be a good idea. 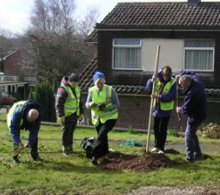 There was a very good turnout for the gardening session at the Vicarage Lane bed. Only Roy Dutton and Anne Shaw could make it to the Issac Walton bed. It was decided that a gardening event should take place every two weeks whenever possible. Chris Wright has weeded the New road bed. All the gardening hours need to be recorded and sent to Anne Shaw when possible. Thanks to Don Brandreth who has planted up the corner of Cygnet Road at Madeley heath as well as donating the plants. It was decided not to enter the RHS its your Neighborhood scheme this year. It will be considered next year. Alan has treated the Long trough with a wood preserver. Proposed meal at the Evening Spice. Chris and Sue Machin send their thanks for the card and gift. John Berrington also thanked the Tidy Group for the vouchers. Thanks to Helen who organized the meal at the Offley Arms. A litter bin is required by the New road bus stop. May 28 , June 25 , July 30 , August 27 , September 24 , October 29 , November 26. An improved household recycling scheme is about to start. Tidy Group Minutes 14th March. Balance at the end of February £1128.31. A big thank you to John Berrington ,who after 16 years of service to the Tidy group has decided to retire. Debbie Burns has volunteered to help out with Treasurer duties if required. Thank you to Helen and Roy Dutton for volunteering to take this role on . Anne Shaw thanked Sue and Chris for all their hard work over the past 16 years of the Tidy group. Chris and Sue are moving out of the area so will be retiring from the Tidy group. Everyone in the group agreed and everyone wished them well. A big thank you to Anne Shaw who has volunteered to take on the Chairpersons role . Thank you to Chris Machin , who has decided to retire after many years of hard work. Phil Shaw has volunteered to take on the P.R. Duties. Helen and Roy have volunteered to take on the Sponsorship role . Debbie burns has also volunteered to help if required. The daffodils have been exceptional this year especially around the pool at Holm Oak drive. The gardening season is about to start. This years daffodils have been planted mainly up at Madeley Heath. The RHS its your neighbourhood application is open until 30.5.16. if required . Ricky’s memorial tree is at Elmside Nursery awaiting planting . Permission required from the trustees .Anthia to be contacted. Chris Wright suggested a regular gardening time each week, meeting at the Vicarage Lane bed. Starting on Monday the 11th April ay 10.30am. Then the 2nd Monday of the month. A meal has been arranged at the Offley Arms on Friday 15th April. April 30 , May 28 , June 25 , July 30 , August 27 , September 24 , October 29 , November 26. ACTION . Alan to paint the newly repaired Long Trough with wood preserver. ACTION. Pete Wells from Apedale to be contacted about Workshop kits for Bug houses and Hedgehog hotels. Chris Wright to arrange bird box and bird tables kits. Planting theme for the flower beds. Aim for all year round colour and wildlife friendly .. Obtain bag-o’s from Newcastle under lyme borough council. Cut back the grass next to the foot path at the Vicarage Lane bed. At The Madeley Centre at 7.30pm. Please come along if you’re free.